Do you find a dimly-lit workspace preferable to a brightly-lit office? Some people do. Perhaps you find it calming and relaxing; or maybe the setting makes you feel comfortable at a visceral level, because of its similarity to the firelit cave/camp background where humanity spent so much of its history. Either way, we may be shooting ourselves in the foot when we labor away in dim office caves. The results of a recent study released by Michigan State University neuroscientists has re-emphasized our need for bright light in order to function at peak productivity. Nile grass rats, the subjects of the study, have a diurnal lifestyle and biological systems much like ours. The researchers observed significant negative effects in the behavior and brains of subjects deliberately exposed to dimmer-than-normal lighting for 12 hours a day for four weeks. The lighting wasn’t terribly dim; it more-or-less equaled the brightness of an overcast winter’s day. The rodents exposed to dim light didn’t do well on performance tests where they’d previously excelled, and parts of their brains lost 30% of learning capacity and memory. Their findings make sense, if you think about it. We’re wired to be active during the day and mostly sleep at night. Since our sun produces white light (a mixture of the full spectrum), bright, full-spectrum light helps us wake up and get moving. That’s why we can feel sluggish on overcast and rainy days, and why Seasonal Affective Disorder is a real thing. Winter days, especially in northern climates, just aren’t as bright as spring and summer days. Offices where management tries to cut costs by dimming lights or deactivating every other light may also contribute to dim-light dumbness. 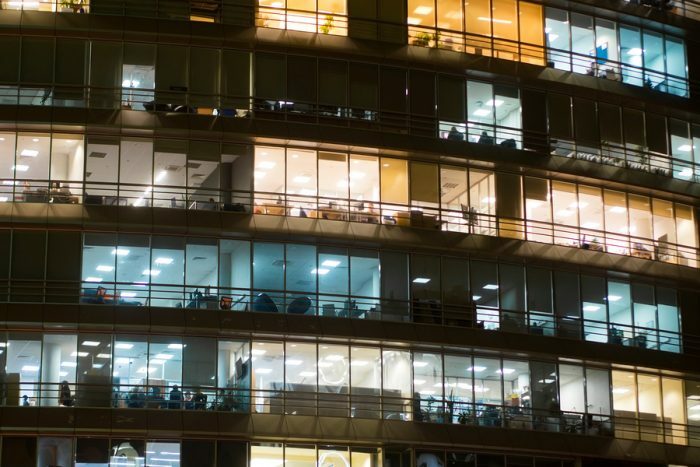 Long-term exposure to dim light during the workday suppresses the release of a neurochemical called brain derived neurotrophic factor, which maintains healthy connections among brain cells. Rats that had already learned to successfully transit a water maze in the Michigan study began to forget how after dwelling in dim lighting. Dim lighting also impairs spatial learning, which was especially apparent in the water maze tests. The dim-light rats got worse and worse at it over time, while another group exposed to bright light for the same period got better at it. The ability to judge and remember spatial conditions was clearly degraded in the dim-light group. The hippocampus, an area of the brain tasked with transferring information and regulating learning and memory, was discovered to have 30% fewer dendritic spines than in normal-light rats. These spines form connections among brain cells that allow them to transfer data. In short, this crucial part of the brain lost almost a third of its capacity during the trial. That’s shocking, because if you can’t access and use your memory, it doesn’t matter how much information you have stored away. Think of it as a hard-drive with a loose connector: It may be chockful of data, but if the computer can’t transfer old data to the processor or write new data to the drive, then it’s useless. Imagine if this happened every third time you tried to save or open a file; or worse, every third step as you tried to walk across the street. Other research demonstrates that the presence of even small amounts of light as little as the brightness of a single candle or less (5-10 lux) — can prevent you from getting a good night’s sleep. Test subjects who slept in total darkness showed better cognitive abilities, especially in association with memory tests, than those dealing with minor light pollution. The right inferior frontal gyrus, a part of the brain involved with attention control, response inhibition, and detection of task cues, tends to become less active the darker it gets. It’s also possible light pollution causes your melatonin levels to decrease, waking you up. So much for nightlights! Not being a Nile grass rat, you can cure the problems caused by dim light with lighting that mimics natural sunlight, with incandescent lamps, and by providing brighter light overall. You can also spend more time outdoors. The key is plenty of light while you work, and no light at all while you sleep.